This is my family shrimp with eggs scramble recipe, with tender and soft flakes of egg clinging gently on the plump and crunchy pink shrimps. 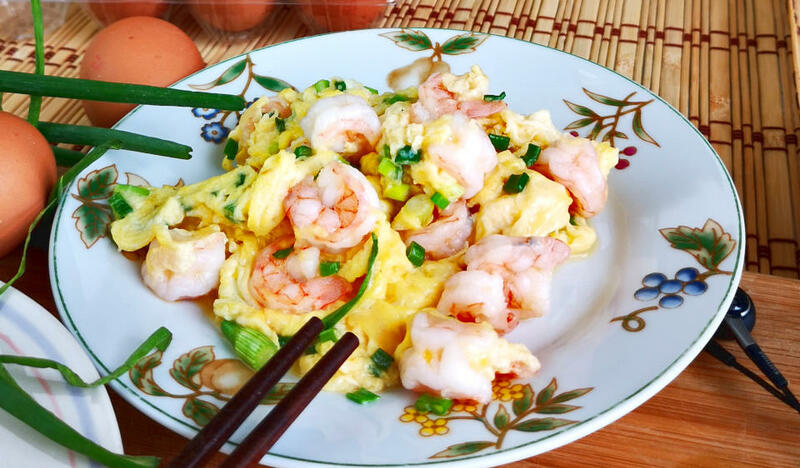 I am referring to shrimp with eggs (滑蛋虾仁), a traditional Cantonese style home-cooked cuisine which is extremely popular because of its incredible taste and the straightforward cooking steps. However, many people fail to replicate the recipe that they have enjoyed in the restaurant. It turns out that the egg scramble is either too runny or too hard. The shrimps are also not as crunchy as they expect. This article will reveal how to perfect this dish, with all the trade secrets behind the scene. One of the secrets in Chinese cooking is how to make the shrimps juicy, and with a crunchy pop mouthfeel. The method to prevent the shrimps from becoming soft and mealy was once a well-kept secret in the past. 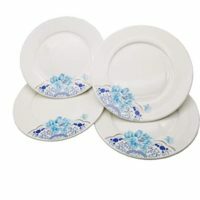 However, thanks to the free-flowing information on the internet, many people are now able to replicate successfully this well guarded, secretive Chinese restaurant trade secret. There are four methods which I came across how to make the shrimps extremely bouncy and crunchy, but with some doubt whether they are all effective. Therefore, I have carried out a test to confirm which method yields the best result. I treated the shrimps with the following methods and then poached them in water for one minute. The following are the result of the tests. Rinse the shrimps under running water for 30 minutes until it becomes translucent. The result: The shrimps shrink after poaching and not crunchy a all. I assume the pH of the tap water is less than seven. The shrimps should turn crunchy if it is slightly alkaline. Marinate the shrimps with a combination of baking soda, tapioca starch and, egg white for 30 minutes. The result: The shrimps look plumps and are very crunchy. Marinate with plenty of salt for 30 minutes, then rinse the shrimps until the water is clear. The result: The shrimps are salty but not as crunchy as number two. Soak in water with baking soda and some salt for 30 minutes. The result: Plum and crunchy just like number two. 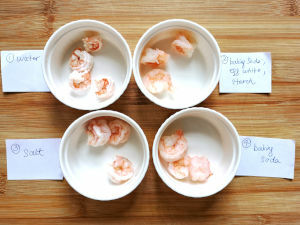 Conclusion: Soak the shrimps with baking soda and salt solution for thirty minutes yield the most crunchy shrimps among the four different methods. The tapioca starch and egg whites are unnecessary. I have read from some articles explaining that the baking soda with pH9 can alter the texture of the shrimps to make it crunchy. I know not everyone is so meticulous about the crunchiness of the shrimps. However, I have been obsessed with this and eager to find out the result. After all, it is not hard to use this method to do it at home. Remove the shell, and devein the shrimps. Place the shrimps in a bowl. Add 1 teaspoon of baking soda and one teaspoon of salt and sufficient water to cover the shrimps. Keep it in the refrigerator for thirty minutes. Rinse under running water to remove the baking soda and salt. Poach the shrimps in boiling water until they turn color. Remove and drain. Do not cook the shrimps for too long as we do not want them to lose the flavor. I only poach the shrimps for one minute for the small one, which is about 70 of them per kg with the shell. Poach a little longer if you use the larger shrimps. Note: The process of treating the shrimps with baking soda will make the shrimps crunchy, but at the same time will reduce the meaty mouthfeel that resembles crab meat. Therefore, it depends whether you like the texture, or you can skip this step. This method is also used to make the famous dim sum Har Gow. Cook the shrimps separately because it takes a longer time to cook through than the eggs. Poach the shrimps as I mentioned above. Pan-fried the shrimps with some oil over low heat until they turn aromatic and pinkish. The shrimp and eggs scramble will turn out fabulous by using either one of these methods. Tips: After dealing with shrimp, wash your hand with a teaspoon of baking soda can effectively remove the shrimpy smell off your hands. 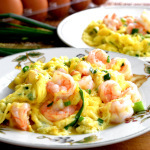 Preparing the shrimps with eggs scramble is easy, but you need some skill to get the silky smooth consistency, nearly set egg with the bright golden color. The perfect result is neither a shrimps stir-fry, pan-fried egg or an omelet. It should look like a scrambled egg but is smoother and slightly runny. This appearance matches the Chinese name of the dish 滑蛋虾仁, which means ‘smooth egg with shrimps.’. The standard of this dish is judged by the smoothness of the eggs. Crack the eggs in a large bowl. Add the salt, sugar and sesame oil. Cut some scallion crosswise into 1/3 cm short pieces and add to the egg. Beat the egg until well combined. Mix the cornstarch and water in a separate bowl to form a slurry. Combine the cornflour slurry with the egg liquid. Add the poached shrimps to the egg mixture. Heat the oil in the wok until it starts smoky. Pour the egg into the wok, turn off the heat, or reduce to the minimum. Move the egg mixture gently until it is nearly cooked. Dish out immediately. Dilute the egg with some water is an effective way to form a smoother texture. However, water does not mix well with eggs. The problem is commonly happened to scramble egg prepared with milk, that the milk will separate from the egg after keeping it for some time. The trick to let the water and egg combined well is to use cornstarch to hold them together. Mix one part of cornstarch with two parts of water in a separate bowl to form a slurry before adding to the egg mixture. The cornstarch will form lumps if you add it directly into the egg. Combine with the eggs and beat until homogenous. You can also use milk instead of water for a richer flavor. 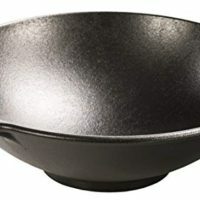 Pour a ladle of oil into a well-seasoned wok to cover the whole surface that will be in contact with the eggs. This step will minimize the egg from sticking to the wok. Pour away the excess oil back to the storage container. You can reuse the oil for another stir-frying session, or use it for deep-frying. Add some additional oil if it is too little remains in the wok. Heat the oil until it starts to smoke. This step is crucial. Switch off the stove or reduce the heat to a minimum). Pour the egg and shrimps mixture into the wok. The egg will start to sizzles at the side of the hot wok. Push the egg from the center to the edge gently before it is fully set. Let the uncooked egg liquid flow to the center to keep contact with the hot surface. The egg will start to form fluffy curds and clings on to the shrimps. Once the egg is seventy percent cooked, dish out immediately, The remaining egg mixture will eventually set by the latent heat. If you wait until all the egg is solidified, it will lose its smooth texture. 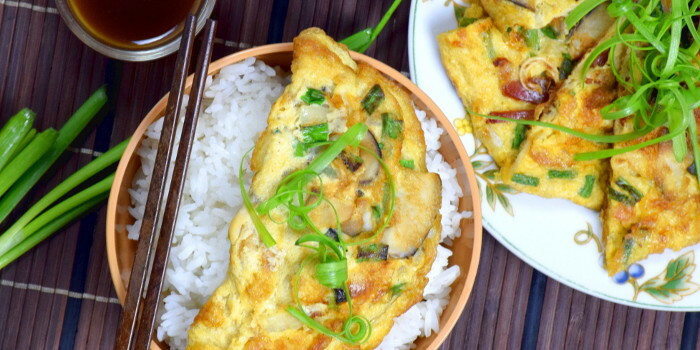 This Chinese egg recipe is ideal for anyone who wants to have a delicious quick meal. 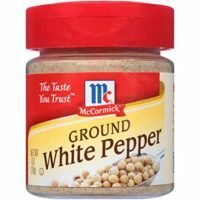 Best to serve with rice, or be a side dish for a heavy breakfast. The best thing is it just takes one minute of poaching and another minute of scrambling! 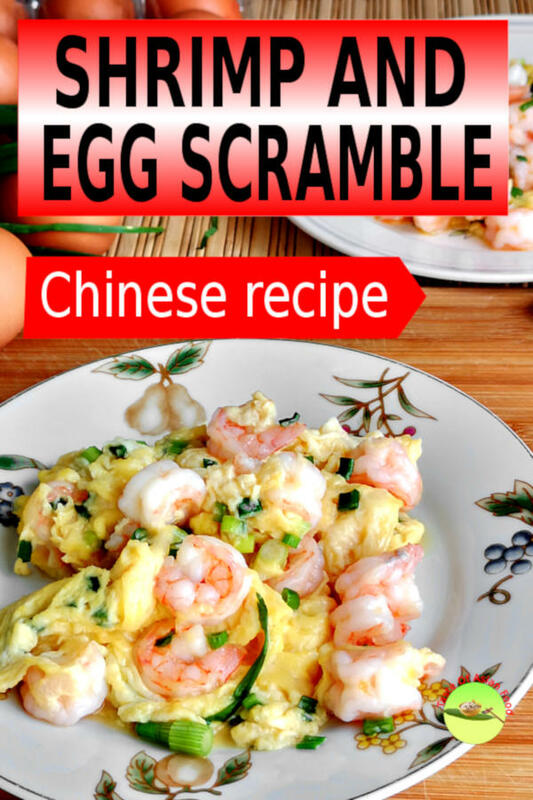 Shrimp with eggs scramble (虾仁炒蛋) is a traditional Cantonese style home-cooked cuisine hugely popular because of its incredible taste and the straightforward cooking steps. This article will reveal how to perfect this dish, with all the trade secrets behind the scene. Add 1 teaspoon of baking soda and one teaspoon of salt to the shrimps. Keep it in the refrigerator for thirty minutes. Rinse. Pouch the shrimps in boiling water until they turn color, about one minute. Drained. Mix the eggs, salt, sugar, sesame oil, chopped scallion and pouch shrimps in a bowl. Heat the oil in the wok until it starts smoky. Pour the egg into the wok, turn off the heat, or reduce to the minimum. Lightly move the egg until it is nearly cooked. Dish out immediately. 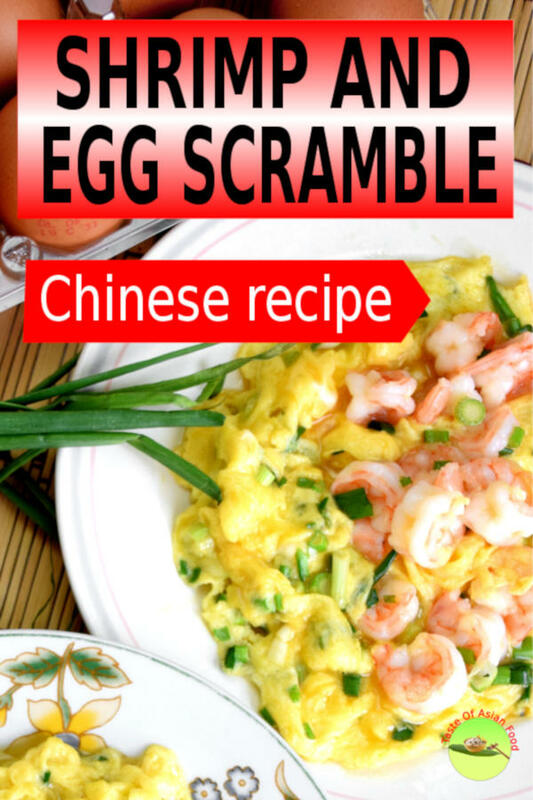 1 Response to "Shrimp with eggs scramble -How to make a perfect dish with 2 trade secrets"